These are the words of a Hammarby supporter I speak to before my second visit to one of Stockholm”s derby matches. The words could just as easily have come from a Djurgarden fan, because that’s how these matches work around here. Sure, the match is the main event – but there are so many more victories to be had than winning the game. Who can cover the lampposts around the stadium with the most stickers? Who can produce the best tifo? Who can be the loudest? Who can go the craziest at half time (that’s a thing here) and so much more. It often feels like the game is not a battle as my new friend suggested, but a war – fought on many different fronts. This is the first time the two sides have been in the same division for almost a decade, and you can really tell. The hype has been building for months now, with both DIF and Hammarby fans sending me messages on Twitter promising hatred, passion and carnage – three valuable ingredients to a football rivalry. I attended AIK – DIF last season, but this one felt a little different. Back then, the guys I was with had said things like “we get these buses every season” or “we always meet in this park”. With the last home game against Hammarby coming over six years ago, it means that many DIF supporters would never have experienced the derby as an adult. This was all new. They say that your first love is the strongest, and perhaps the same can be said of your first hatred. I thought I was going to miss out on this game, all thanks to an Excel spreadsheet. I had been eagerly awaiting the tickets going on sale, only for someone to run frantically to my desk at 9:57 – a whole three minutes before they would be released. By the time I had dealt with the problem, I was being faced with the words “no availability” in Swedish. As I prepared to go and change my colleagues screensaver to pictures of various abusive hand gestures, I decided to email the club directly. They informed me they had a 100 or so left in reserve, and agreed to sell me one. The trip was on, and John’s screen would remain free of me calling him a knobhead, at least for now. I like to arrive early for matches in Europe, instead of squeezing in one more pint at 14:47 like we do in the UK. 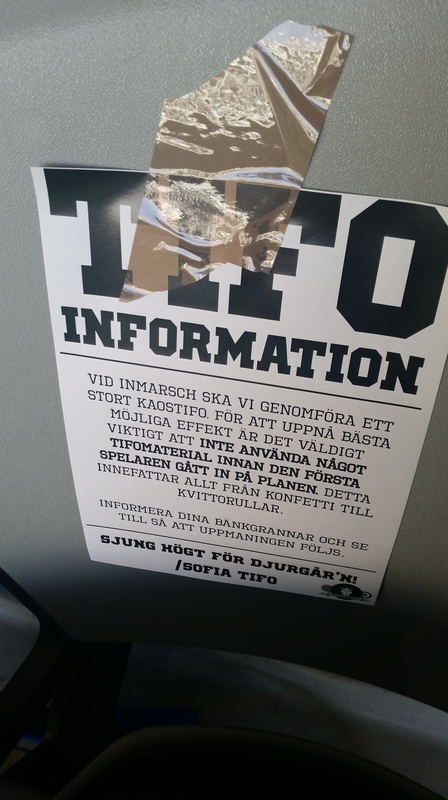 I got in to the Tele2 arena about 40 minutes before the game starts, and was greeted by a huge range of tifo materials in the DIF section where I would be located. 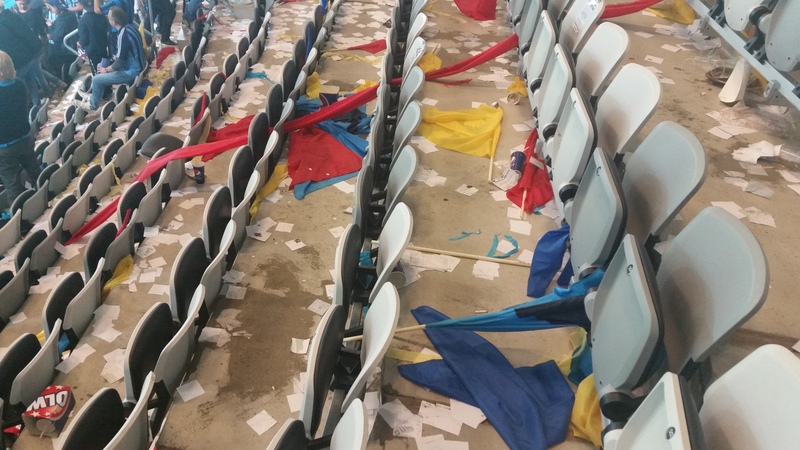 Confetti cannons, streamers, torn up paper, flags, banners – they had it all. It was less clear what to expect from Hammarby, with a large green and white banner at either end of the away stand the only clue at this point. They made great use of this early advantage, starting the anti-Djurgarden songs and bouncing up and down as the clock wound down until the scheduled 7pm kick off. I say scheduled, because a Stockholm derby starting on time is simply unthinkable. These matches are delayed so frequently that they last about as long as the average NFL game. 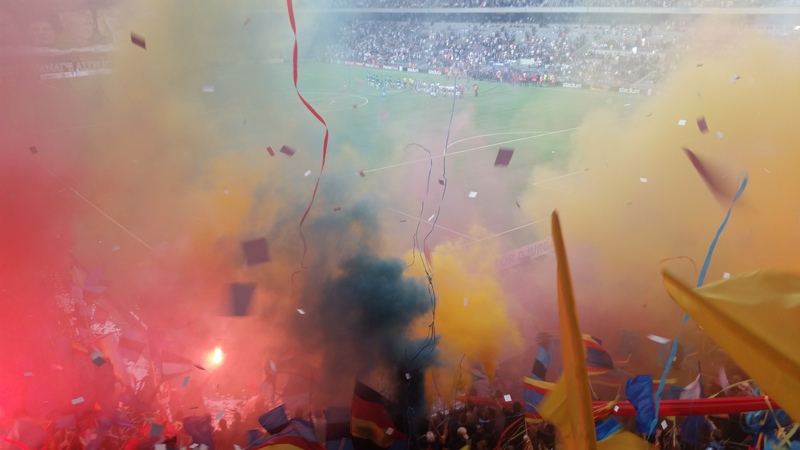 Despite the fact that everyone knows the game won’t kick off for some time later than scheduled, the stadium was packed by 6:45, with the DIF supporters behind the goal collecting their tifo materials to welcome the players to the pitch. Instructions were left on the seats as to what to do. If you don’t speak Swedish, the gist of it is “Don’t throw anything until the players come out, then go ******* mental”. From what I could see around me, I know the entrance was going to be good – but I wasn’t prepared for quite how good it really was. 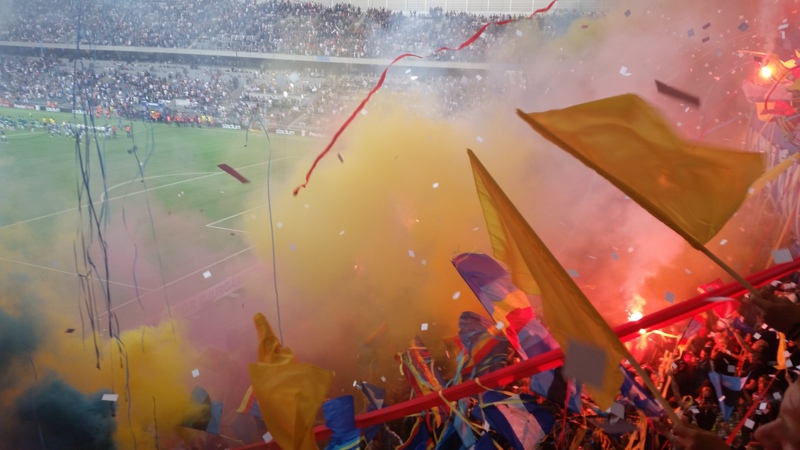 The stand exploded into an inferno of red, yellow and blue, streamers flying through the air, the sky blocked out by confetti and hundreds of flags waving in unison. 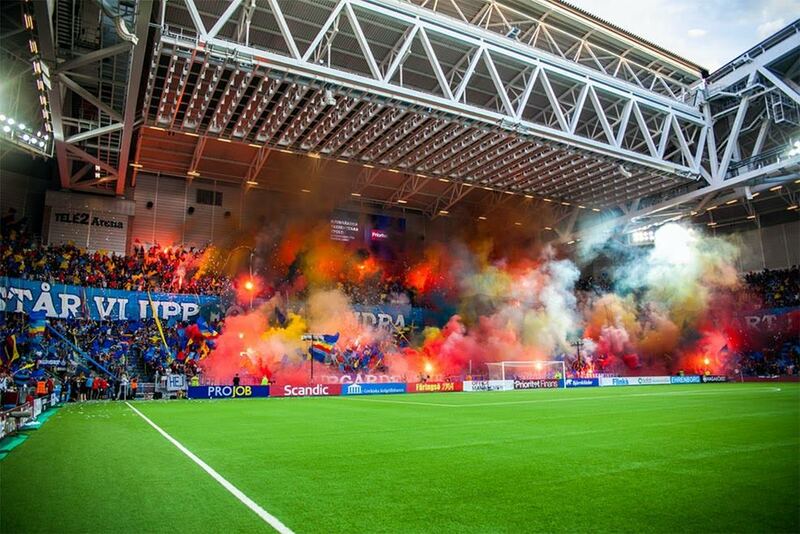 Alongside all this was an unbelievable amount of pyro – the Djurgarden terrace looked like someone had bombed a firework factory. My pictures don’t really do it justice, because I didn’t want to be a tourist and only took a couple once I had finished throwing everything around me that I could find but believe me…it was really something special. In an era when colour and passion is being replaced by YouTube celebrities and people have furious discussions about “net spend” outside of football stadiums, this was a wonderful reminder that football isn’t about spreadsheets, it’s about supporters. The Hammarby supporters also produced an extremely nice tifo, although due to my lack of Swedish I didn’t initially understand it until it was explained on social media after the game. A huge banner was held up along the entire stand painted with the pictures of many well-known supporters who have sadly passed away in recent years. 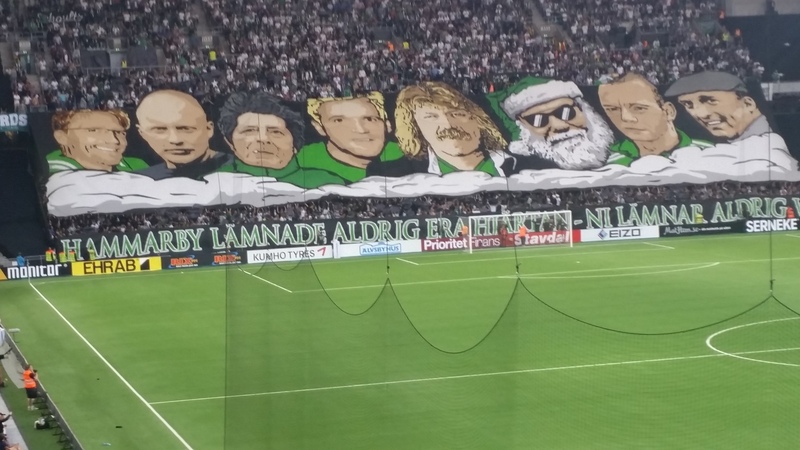 This was accompanied with a banner which read “Hammarby never left your hearts, you will always be in ours”. There were also many green flares across the whole of the stand, adding to the huge amount of smoke that had filled the stadium. As a result, the players headed back off and the game would not start for another 28 minutes (I checked). During this break the noise from both ends of the stadium was absolutely non-stop. This was my third DIF match so I knew what to expect from their superb supporters, but I was also deeply impressed by Hammarby. The only experience I had with Hammarby fans before this game had been the abusive comments they left below my articles whenever I said something nice about DIF, but their claims about top quality support were being backed up by the tremendous support coming from the away stand. At one stage they kept up one anti-Djurgarden chant for 10 minutes without pausing for breath, getting louder and louder with each rendition. Of course, the DIF supporters had many insults of their own to fire back with, and I would happily have watched 90 minutes of the two sets of fans abusing each other without the need to even play a game at all. However the referee did eventually decide to let the players kick a ball about, and in the opening minutes it was the visitors who would take control of the game. DIF had been challenging for the title just a few weeks ago, but a damaging defeat to AIK seems to have ended that dream unless something spectacular happens in the coming weeks. It has been quite some time since DIF won a derby, and the nerves were obvious for their blue shirted players – despite Hammarby hovering just above the relegation places. Just moments into the game, the early pressure from Hammarby would pay off. A through ball played towards the striker looks as though it will be intercepted, only for the defender to misjudge it completely. The goalkeeper came rushing out to try to make up for his teammates mistake, but the ball was lofted over him and came to rest in the back of the net. The large Djurgarden banner which ran along the length of the stand read “We stand together as one behind you, now fight for your team” – advice that it took the players less than five minutes to ignore. 1 – 0 to Hammarby, and the away stand was sent into absolute chaos, a number of flares appearing and no doubt hundreds of bruised shins would also appear in the morning. 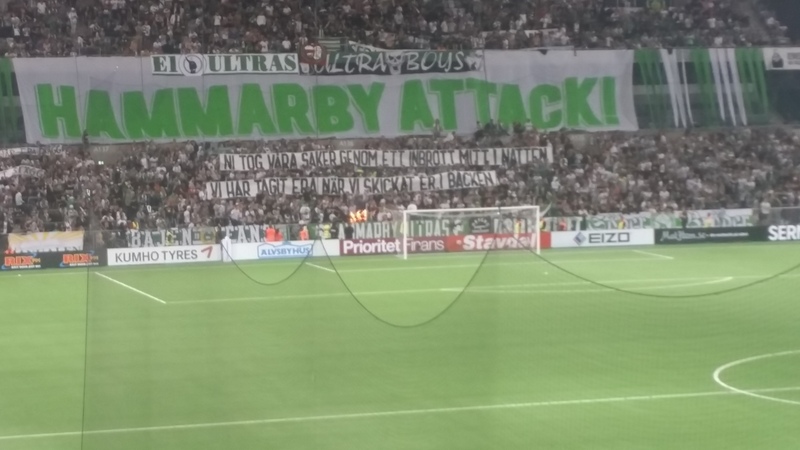 In comparison, clearly their players had listened to the huge “HAMMARBY ATTACK!” banner in their stand. I can compare the noise to when I saw the away stand at Lazio celebrating a goal against Roma, and there had been 20,000 of them! The DIF supporters also deserve credit for their response to the goal, falling silent for only a matter of seconds before they were singing again, even louder this time with a renewed purpose. Just like I have observed in Serbia, Swedish fans really see themselves as having a responsibility to the club. If the players are not performing, it is because they aren’t singing loud enough. The capos were soon leading encouraging chants to try to urge their players on to an equaliser or more. Still, it was Hammarby pressing forward and winning a number of corners, each Hammarby corner taker facing barrages of abuse when they had to get close to the stands. DIF were eventually able to get themselves into the game after the opening 25 minutes or so had been almost completely green and white, but they were not able to find a way past the determined defence of the away side. Much to the frustration of the Djurgarden supporters, the score would remain 0 – 1 as the half time whistle blew. Now in most countries, half time is where a terrible DJ hosts a competition that nobody cares about while the supporters go off for a pint or a ‘meat’ pie, but in Sweden things are a little different. During big games like this there are often displays during the break, and I could tell that was going to be the case here once more as soon as the large flags appeared and covered both ends. This is the telltale sign that something cool is about to happen, with the flag being used as protection from CCTV so that those involved can hand out the pyro, put on masks and that sort of thing. The police and stewards know about it of course but pleasingly, can’t do anything about it. 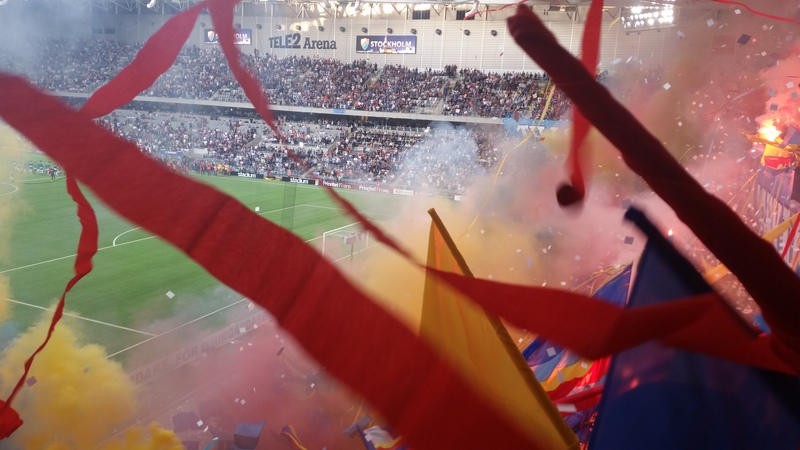 It was DIF who acted first, turning the stand into a fireball with flares being ignited both on the terrace and in the seats in the top-tier, once again creating waves of smoke that would delay the game further still. Indeed, as the players emerged for the second half, the match should have been entering injury time. 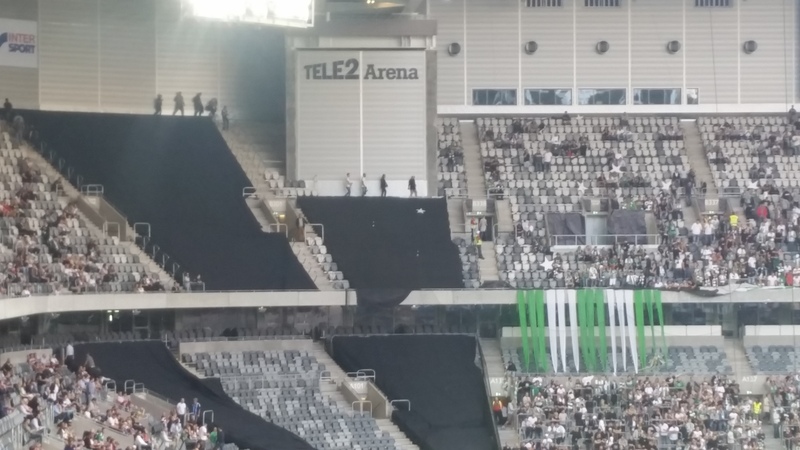 While Hammarby did not put on a huge display during half time, they did burn a number of Djurgarden scarves and shirts which they had stolen at some point – another European tradition! If that was the case, Djurgarden quickly had something to say about it. They looked like a totally different team after half time, absolutely bossing the opening minutes of the half. The pressure was almost constant during this spell, and if they had converted all their chances they could have been winning 3 or 4 – 1 rather than continuing to trail by a goal. Of course, Hammarby had enjoyed a similar spell of dominance in the first half, it’s no exaggeration to say this game could have easily ended 4 – 4 or higher. It was inevitable that DIF would score if they maintained such a high level of pressure, and the only real surprise was that they had to wait until the 58th minute. There were two incidents inside the box almost at once, one of them that certainly wasn’t a penalty and one of them that probably was. I believe the referee blew his whistle for the wrong foul, but perhaps justice was done overall. The run up from the penalty taker was unconvincing, but he still managed to beat the keeper and find the net, his equalising goal sending the home supporters into delirium. I often talk about the unity between players and supporters in European football, and there was a nice metaphor for this after the goal. 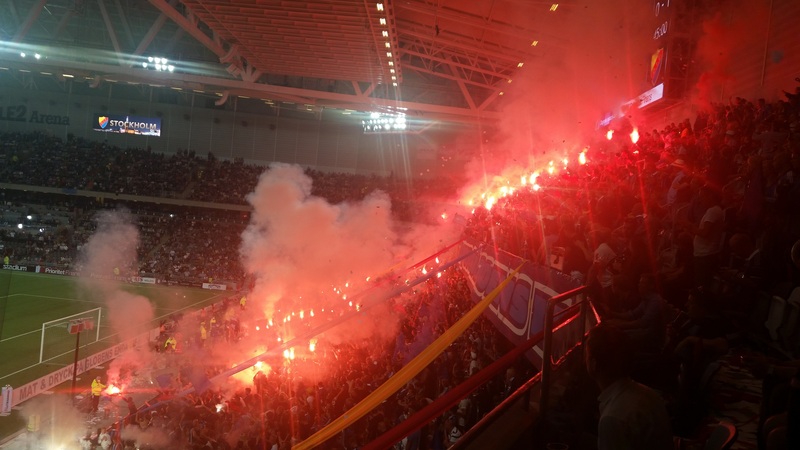 With Djurgarden on fire on the pitch, the fans made sure the stands were also on fire to celebrate the equaliser – with plenty of flares set off once again. 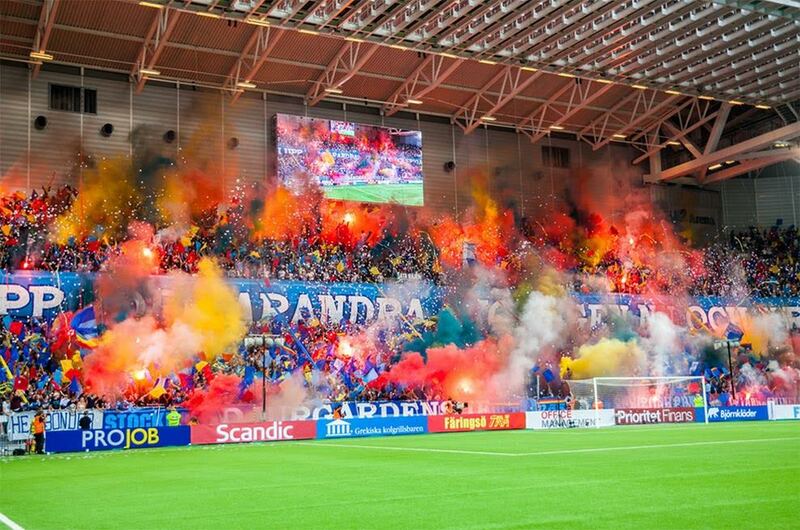 Swedish ultras must buy trousers with incredibly deep pockets to have all this pyro on hand, because the supply seemed never-ending. 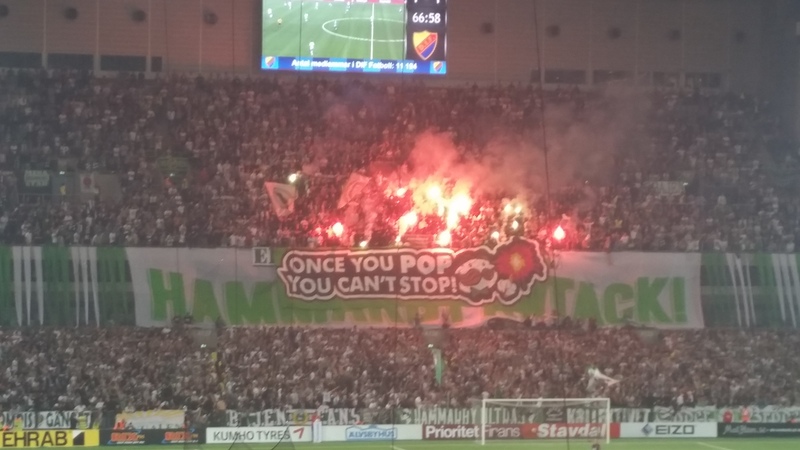 Talking about never-ending pyro leads me nicely into the Hammarby banner which was displayed about halfway through the second half, one of the best and most creative banners I have ever seen inside a football stadium. I recently counted exactly how many this was and I’m on a total of 117 stadiums, which gives you an idea of how much I liked this one! It became clear what the away fans had been doing during the half time break, as ‘ONCE YOU POP YOU CAN’T STOP’ was unfurled from the top tier – accompanied by a picture of the Pringles mascot waving a flare about. I realise some people won’t be a fan of using something commercial in a banner, but I absolutely loved the creativity. Bulldogs, skeletons, ex-players – these things appear on tifo banners all the time, but this was something truly new that hasn’t been seen anywhere before. Once the banner was displayed properly, the away end was set alight by a huge number of flares (both green and red), and true to their word – they would continue burning all the way to the final whistle. If it was loud in the away end before, it was about to go absolutely off the Richter Scale. I’ve watched the goal a few times on YouTube since and I still can’t decide if it’s a great strike or if the goalkeeper deserves to be sent to a North Korean labour camp for letting in such a shot. Whether it is goal of the season or a catastrophic error, the result was much the same. 2 – 1 to Hammarby, and absolute scenes in the away end. The roar was so loud that it felt like I was standing in the away end itself rather than being at the opposite end of the ground, as the away supporters celebrated taking the lead with just 20 minutes to go. The players jumped over the advertising boards and ran to join their delirious supporters – it was moments like this they had been dreaming of since securing promotion last season. For the DIF supporters, their hopes of playing European football seemed to be going up in smoke faster than the flares which continued to burn around the ground. But there was still to be one twist left in this marathon match which was now approaching three hours since it was supposed to start, and it would ensure that a game that was balanced in the stands would also end level on the field. Popular Djurgarden player Nyasha Mushekwi (known as Super Mush) from Zimbabwe thumped an unstoppable header beyond the reaches of the Hammarby goalkeeper with around ten minutes to play. This time the reaction was less one of joy from the home supporters and more one of relief, they have lost so many derbies recently that they must have been fearing the worst. To keep up their push towards the top of the table they really needed to win, and threw a number of players forward in the closing stages. They did win a couple of corners and were able to get the ball into the box, but the goal that would have sent the stadium into orbit around Planet Scenes was not to be found. The referee finally brought to an end another marathon Stockholm derby, the final whistle coming after 10:00pm for the game which was supposed to end at around 8:45. It was already my suspicion that Sweden was the best place in Western Europe to watch football, and this game proved that my visit to AIK – Djurgarden last season was no fluke. The matches are exciting and with a pretty good quality of football, while the stands are full of people who are there to support the team rather than just to show off their business partners or Facebook friends. The tifos are spectacular and the support lasts for 90 minutes, while even half time contains more colour and excitement than an entire season in the Premier League. Djurgarden hate Hammarby and Hammarby absolutely despise Djurgarden, but supporters of both clubs should love the fact that they are regularly able to take part in some of the best rivalries in the whole of football. 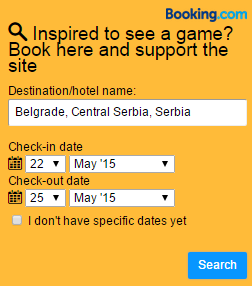 If you are thinking of taking a European football trip of your own and you’re not quite ready to go to Belgrade, this is the next best thing! While there would be no winner of the battle this time around, Sweden as a country is certainly winning the fight against the threat of modern football which has already ruined the sport in so many places. With Hammarby looking very much safe from relegation this time around, the war between Stockholm’s triangle of hatred will continue to rage on. The following pictures of the amazing tifo were kindly provided to me by Djurgarden themselves, all credit to Järnkaminerna, Helena Avermark. Posted on August 25, 2015, in General. Bookmark the permalink. 19 Comments. Looks fabulous mate, worth saving the pennies for the trip. Great write up! Thanks for a great report. We are proud to have guest like yourself at our derbies. I’m a Hammarby fan and even you were in the DIF end you made the experience justice. Please come back for Hammarby-aik in a few weeks. It will be mental! Good article! A classic bajen comment, no words needed actually, “our part of town” haha we are Djurgården the pride of Stockholm enough said! You should be on Hammarby-Kalmar tonight, friday september 28th 2015, our 100 year anniversary. You’d be surprised how much love we are showing to our team despite the face that we are playing against a swedish small town and still we have sold out the entire arena, that’s 31 000+. You are more than welcome to the best crowd in the nordic region. You should edit your post and add some quality pictures of all the tifo’s of Hammarby, the pic’s you posted is of bad quality or showing a not even half “deployed” tifo. You did a very good and fair reportage. Make the pictures the same mate! Hey mate, do you know some good photos I can use that are not copyrighted? That’s the only reason I don’t have the high quality ones for you! You should go to a Hammarby game when they have the most tickets sold, you will be amazed. My plan for next season is Hammarby vs. AIK so I have seen every single Stockholm derby. Haha, once again hammarby fans try to convince people in the comments 😂 your club is just a joke but if internet comments was a sport, hammarby would be playing champions league. Im a Djurgården fan and I have to say your review gave justice to the overall experience. I would say that the Hammarby fans did better than us in the first half, but we did better in the second. Also that our noise levels reached higher peaks but hammarby had better stamina in their singing. So per capita they performed better, as we did at their home derby. It has almost become a given rule that away fans perform better than the home fans in Stockholm derbies. Even if the home fans have an advantage in numbers, the away fans are better organised and are standing closer together. Home derbies often attract non-singing to buy tickets in the ultras end simply because they are cheap. Anyway we have amazing derbies in Stockholm, our fans are terrific. You are welcome back to our end anytime, we did’nt do our best performance this time, but we know our potential, and you do as well since you were at AIK-DIF last year. I would, as a Hammarby supporter say that we are the weakest ones when it comes to singing in Stockholm, atleast in when it’s our homederby. People who support our team refuse to accept the reality and instead post obnoxious comments, as you mentioned before. You can come back in 2017 when our entire singing crowd will be located on the two etages on the same end of the field. Now we have this boomerang thing which is working horribly. In 2017 we’ll also have P.A system and hopefully the non-singers will be gone by then. My hopes are that by then, we’ll be the best in Stockholm when it comes to singing. This game was our best game when it came to singing this year, on our homederbies (especially against Dif) we got ruined and lost both away against Aik.